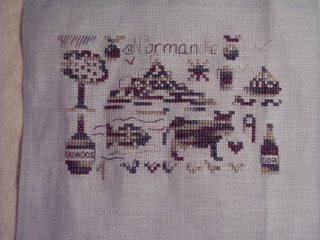 Finally done with all the cross stitch on part one! It's only taken me three months to get it done, nearly. The Rhodes stitches should go quicker. Although a lot of people are using three strands of silk for this, I'm sticking with two. 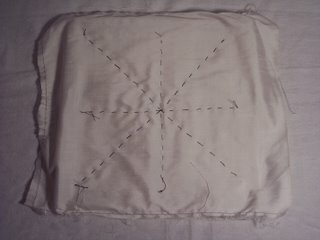 I don't like my stitches sticking out so far from the fabric. It's going more quickly now. 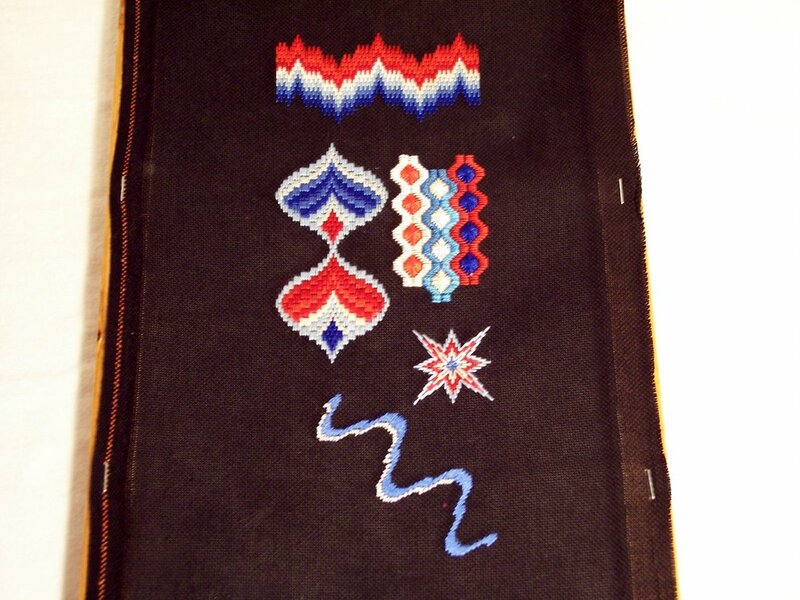 I think the repetition and so much Treasure Braid was making me go slower earlier. 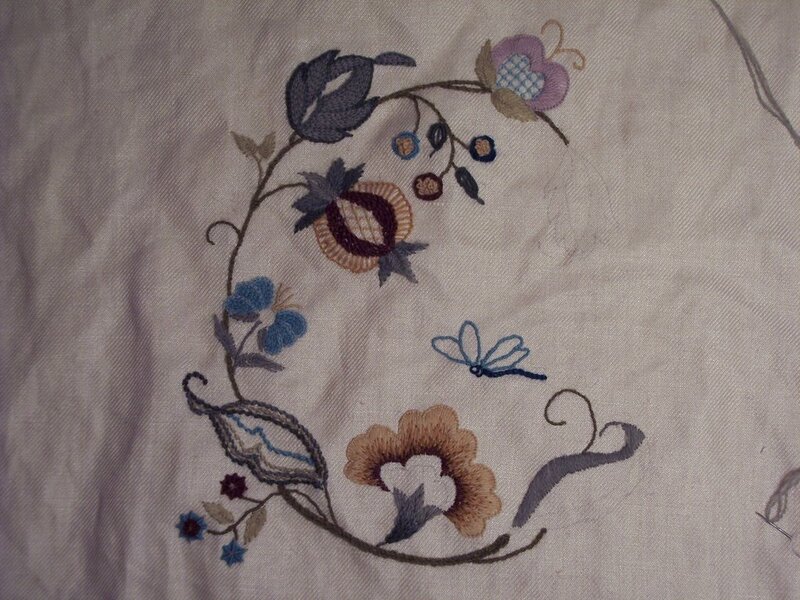 I hope to have all the top part done this week, and maybe to start the bottom special stitches. 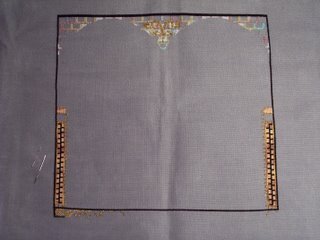 The picture was taken two days ago - I have the stitches on the left outlined now and the Rhodes stitches in the middle are done. 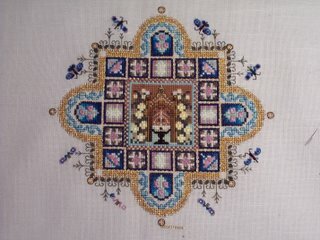 Medieval Town Mandala - Butterflies Done! Yay! I got all eight butterflies done! 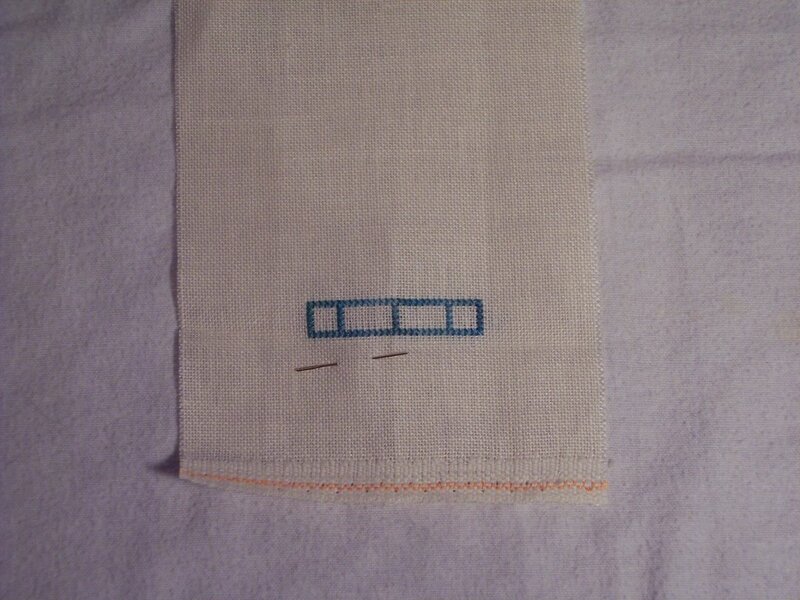 Now I'm stitching the square in Treasure Braid before filling in the corner motifs. This is turning out a LOT sparklier than the picture looked originally. 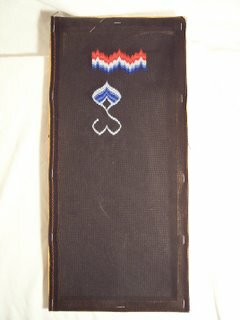 Maybe at one point I'll be able to stitch large amounts of Treasure Braid without getting it twisted. 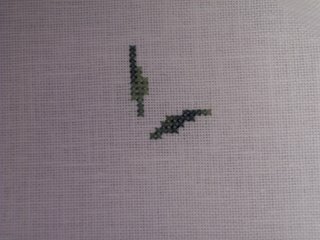 That's my major gripe with all metallics, though - that and the difficulty of keeping them properly even while stitching. This piece is giving me practice with it, though. 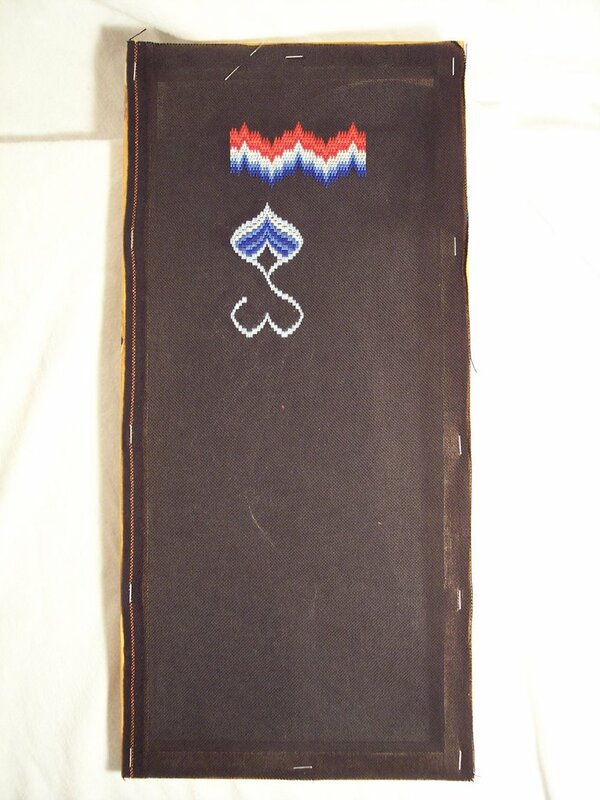 So, this is the beginning of my first goldwork project. 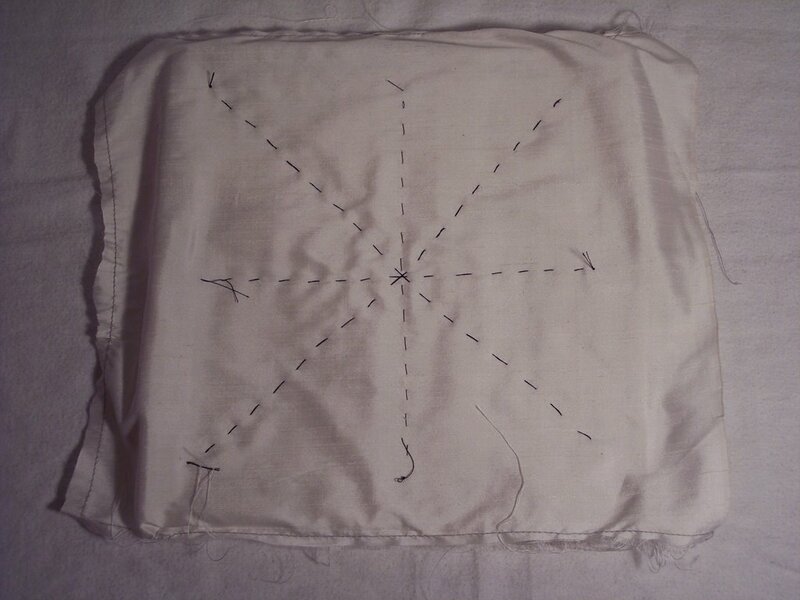 I'm following the directions rather carefully, so under the silk top layer is a linen twill layer attached with staples to a wooden frame made by my wonderful husband. 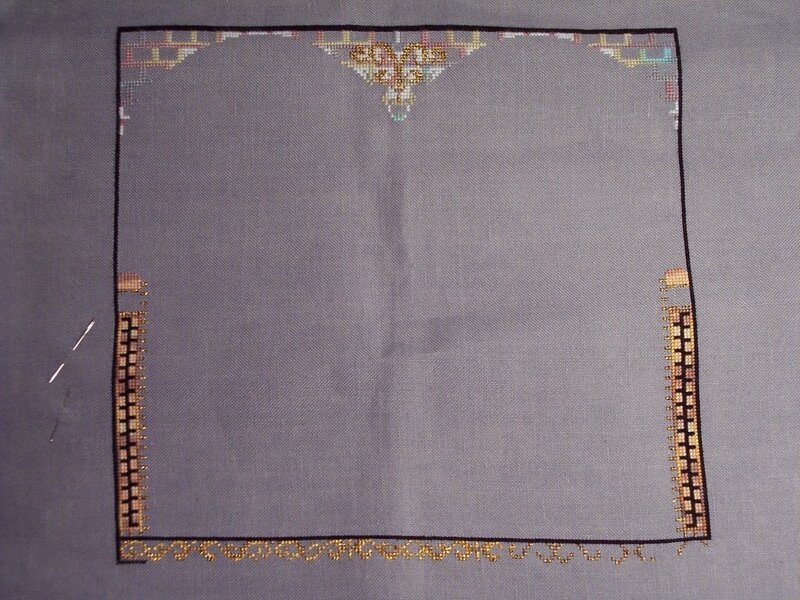 Unlike the transfer for the crewel class that I completed last week, this teacher is having me attach the paper to the fabric and tack the design outline with running stitches. As of now, I think I like it better and would probably use it for crewel. I started the process today. The initial tacking will take a lot longer, but no pencil or carbon smudges and less likelihood of slippage. It seems to give more control, too. 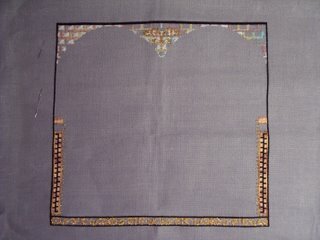 Next week's picture will show how the tacking looks on the silk. These are the two newest projects, and therefore the least stitched. The panda is started and I am working on the largest solid black section now. Once it's done, the rest will go pretty quickly. On the other ornament, the threads used are the same as in the Midi Mystery, and the chart is available only for those taking the Midi Mystery group. Martina evidently uses these smaller designs to check how the colors go together. I'm just happy I get to have another ornament to do for gifts and have all the threads on hand. 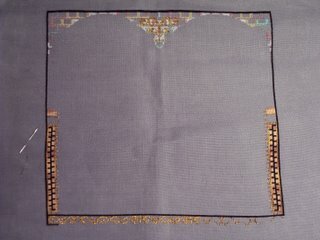 As you can see, I finished sections C and D on the bargello. Only four more sections to go, and I've started one of them. This particular ribbon part is harder to do - the black is really being hard, even with a white background, and the counting to keep everything straight is somewhat of a headache. On the positive side, both my daughter and my husband really like it; my husband is expecially fascinated with the star. Maybe I'll have this ribbon done by the end of the week, but I doubt it. 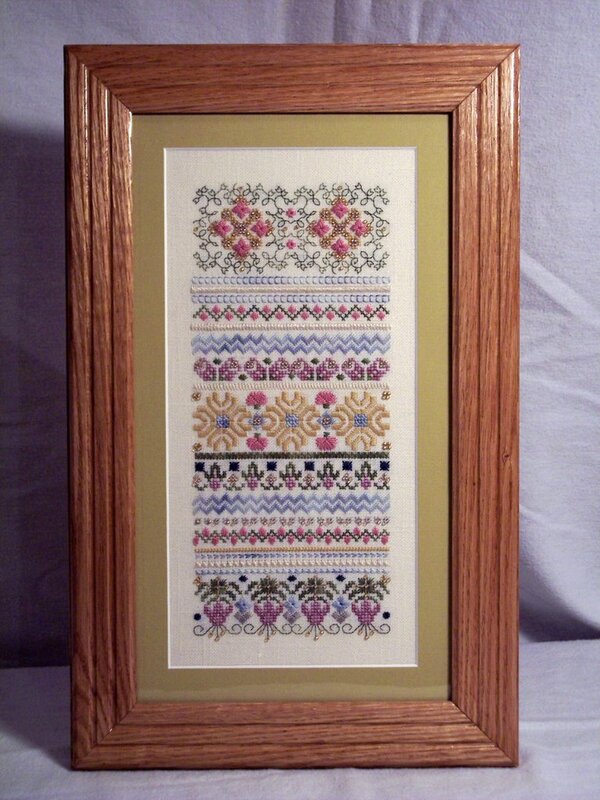 My husband finished another frame - he seems to be doing one per week he's home. Considering the backlog, he'll have a few more weeks to go. 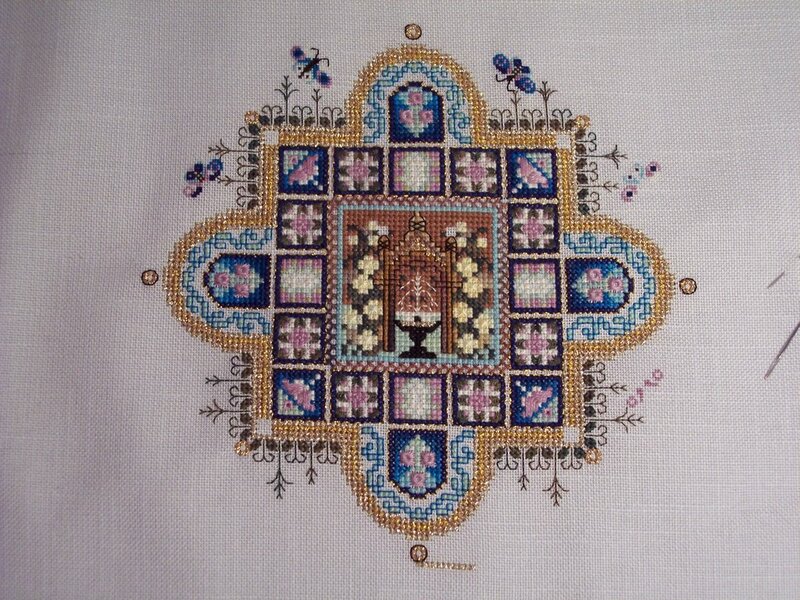 This piece is the Mixed Stitches Band Sampler from the class by Classic Stitches. I took it this spring and the work went fairly quickly. 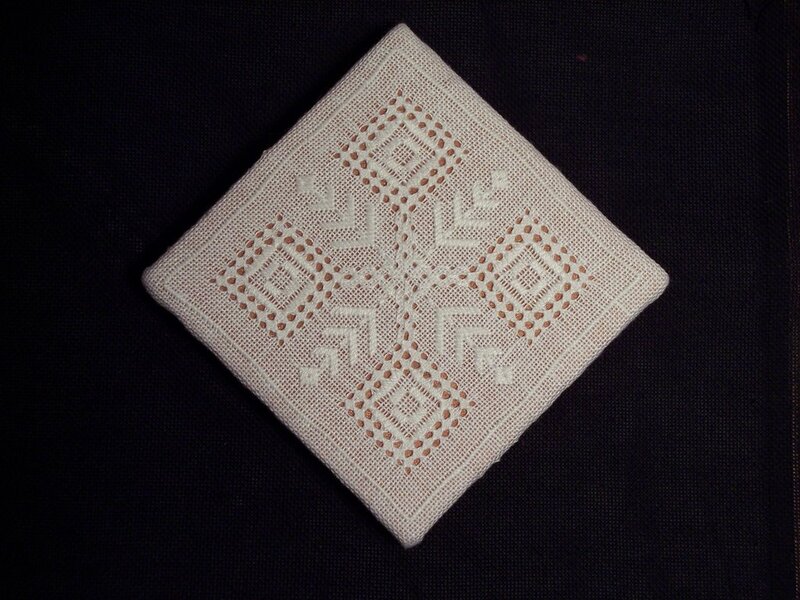 I used a combination of cotton and silk threads on it. I might make another at some point in different colors. 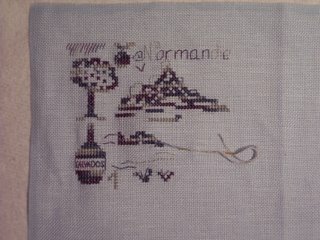 I'm also including a picture of Bleu Normandie, which I finished this week. Two down, several more to go. Taking a break from them and doing a different ornament this week. I like this color combination better than the first, though. I decided to lump in all the other works in progress in one pictureless post because there wasn't much difference in the photos my husband took on Sunday vs the ones he had taken the previous week. So, what's done? Today I finished Bleu Normandie. 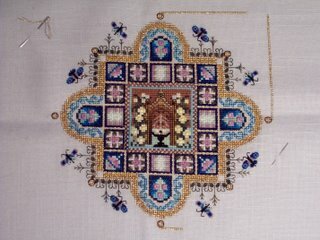 I also have to start a goldwork class I signed up for on the Classic Stitches website. It started on the eleventh and I got my kit in the mail on Tuesday. Until then, I'd forgotten about it. So - I start stitching on that today. 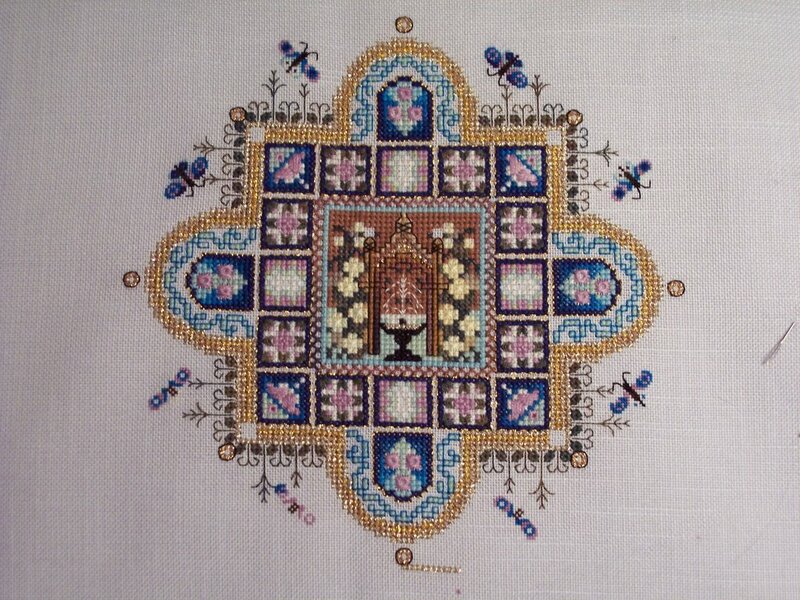 The Medieval Town Mandala is progressing - I finished the final over one butterfly today, and get to work another Treasure Braid square. 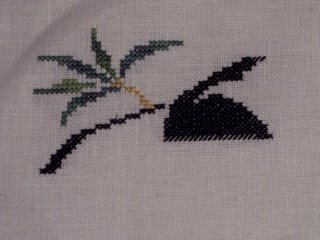 On the Midi Mystery, I finished the cross stitches from Part 1, which means I get to work all the specialty stitches before going on to Part 2. 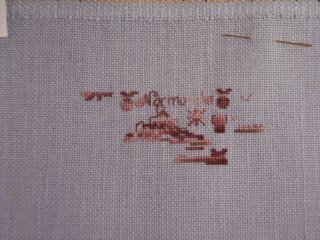 Getting there - the Rhodes stitches go fast. Since I finished Bleu Normandie, I'm also starting a new ornament. Decided to give Normandie a break and will be working the small design that was given as an extra in the Midi Mystery group. It should go quickly; it's not very big. Pictures will be taken again on Sunday before my husband leaves on his business trip for the week. Started Section C of Florentine Fantasy. Since this picture was taken Sunday night, I've added a third, red column. They remind me of distillation columns. My chemistry background is showing with that comment. 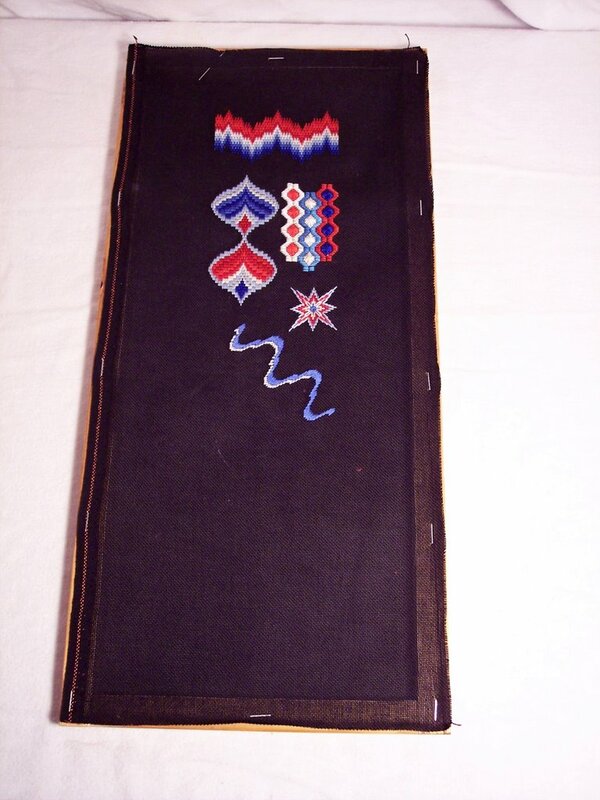 I also filled in the inner part of the white column with red Rhodes stitches. 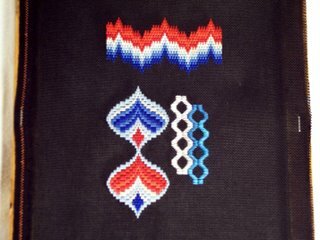 The blue one will have white Rhodes, and the red column will contain blue Rhodes stitches. It's still going pretty quickly and on track for a finish in the relatively near future. Since I finished Crewel Confidence, it's time to start a new piece. This one's Panda Pals by Brittercup Designs. It calls for a lot of GAST, but I didn't have any in my stash and am substituting Needle Necessities overdyeds, which I do have. The black will be DMC. So, I started stitching yesterday before my husband took pictures and this made it in. So far I've only done one length of thread. I'm sure significant progress will be made by the end of the week. 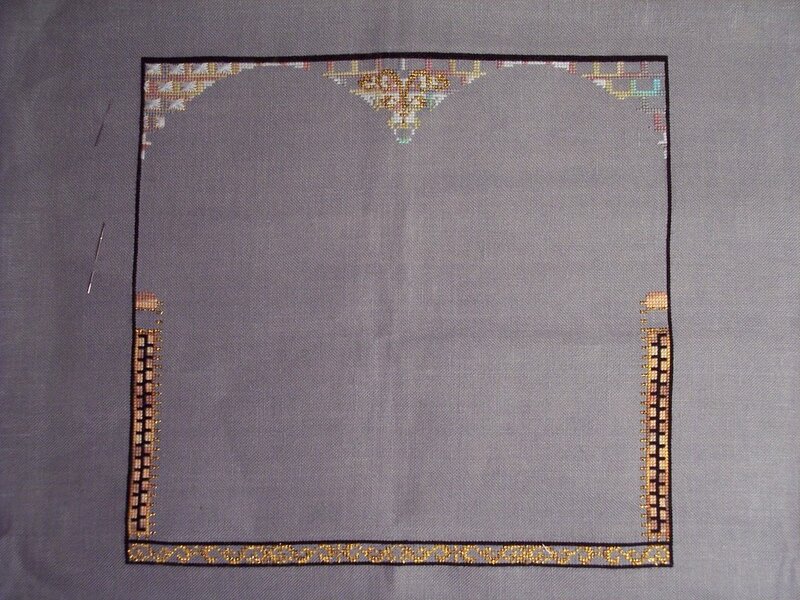 This project already has a home - it's being made for the mother of a friend. The mother has a whole panda room, so this will go in it well. My husband's first framing job! 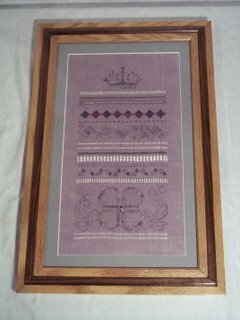 He stretched the piece and the silk under it, made the frame, and picked out the mat, too! Then he put it together. I think he did a great job. 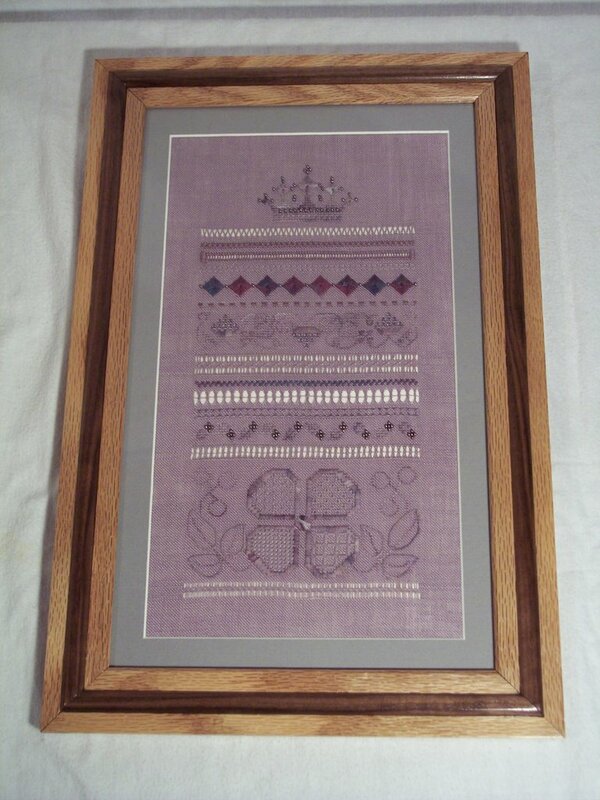 This pattern is the White Queen GSS from the Embroiderers' Guild that I turned into a purple queen. 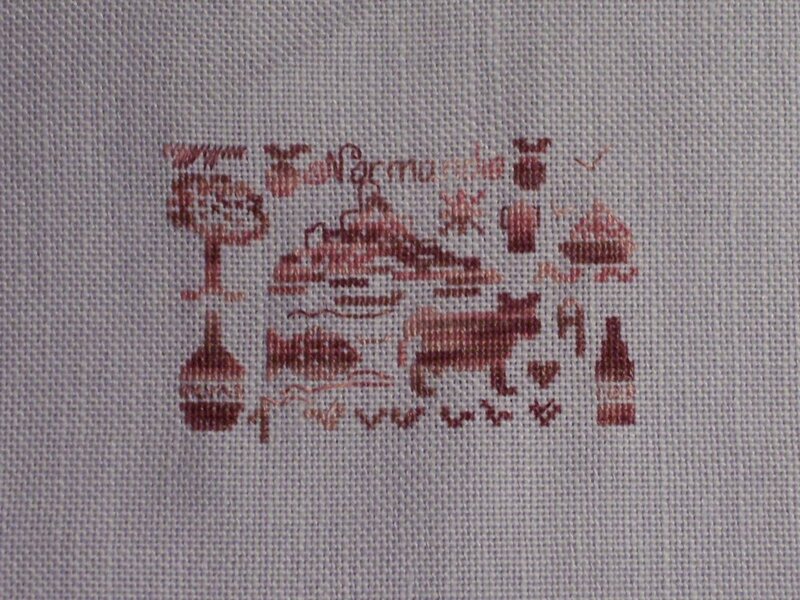 It was my first project ever using drawn thread. I think it came out pretty well. 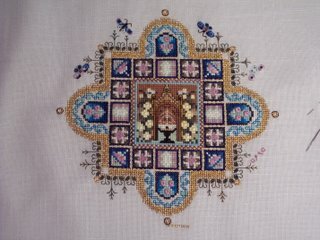 I spent most of yesterday's stitching time finishing this project, Crewel Confidence by Judy Jeroy. While I still feel crewel isn't my favorite thing, it's something I'll consider next time I see a really pretty pattern I want to do. I'm sure my critique will have a lot of things I've done wrong on it, but it was my first time transferring a pattern this way or doing a crewel piece at all in about twenty years. My husband will frame it when it gets back from its critique, and then we'll give it to someone. I just feel sooooo relieved it's done! This is my second Normandie, in the colors picked by my husband. Getting there on getting it done. It has one of the same problems the other one did - the lightest color fades into the fabric. Not too much to do on it. These are fairly quick. Maybe next week I'll actually have some things done! It's not as far as I thought it would be when I posted last week. I took it to do in the car while I was waiting for my daughter to get out of school yesterday and completed the second section and started on the third. 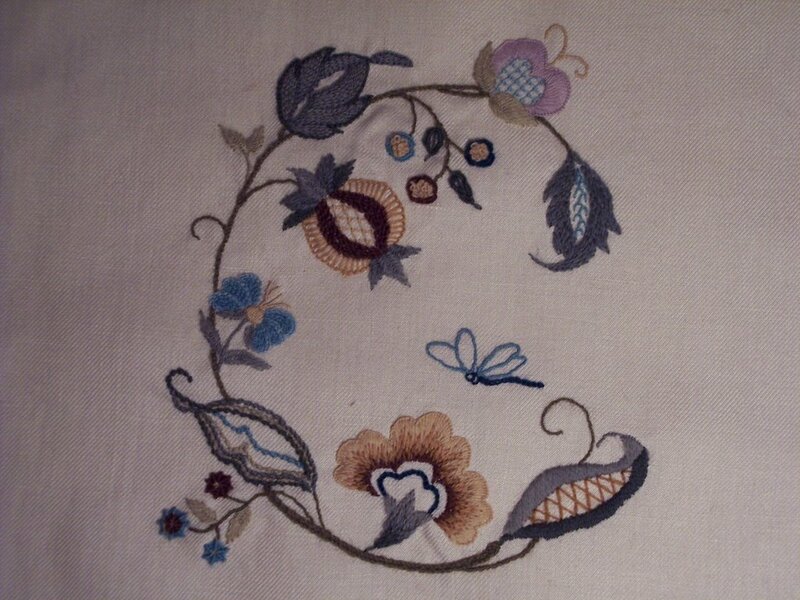 It shouldn't take too long to do, as long as I actually sit down and stitch. Life should be returning to somewhat normal next week, I hope. 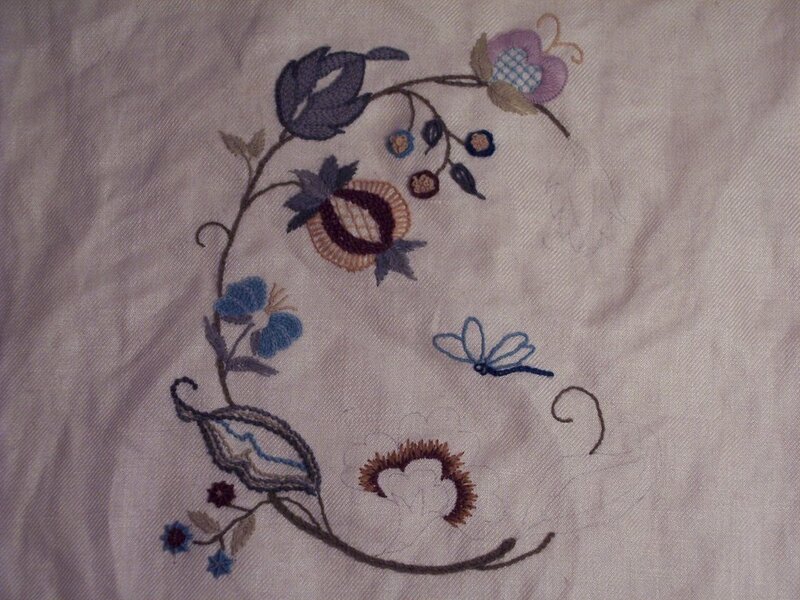 I really want to get this one finished before I go to the EGA national seminar. I've managed to complete four of the butterflies and get the other four about halfway done this week. 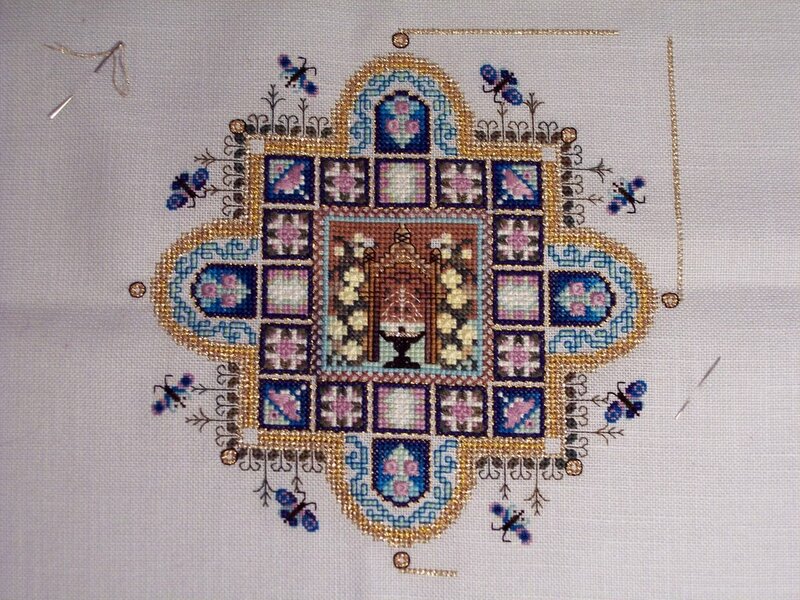 Hopefully I'll be able to start the gold border and the corner areas before the picture next week. Since it's rainy out, I'm hoping I'll be able to stitch more. On the Midi Mystery, I've made progress on all that Treasure Braid on the bottom. It gets annoying to work with since it twists so much. Maybe I'll be able to get to the black bottom this week before completing the Treasure Braid. Martina released a small project using the same threads as the Midi Mystery to the group this week. I might make a Christmas ornament out of it. I Think I Can - So Close! I've got a leaf and a half to go and I'm done! I'll be so happy. My goal is to finish this in a week. I've learned some things about crewel and am less afraid of doing surface stitching now, but it will never be my favorite kind of stitching. It does, however, rank above the hated knitting. The flower turned out better than I thought it would. 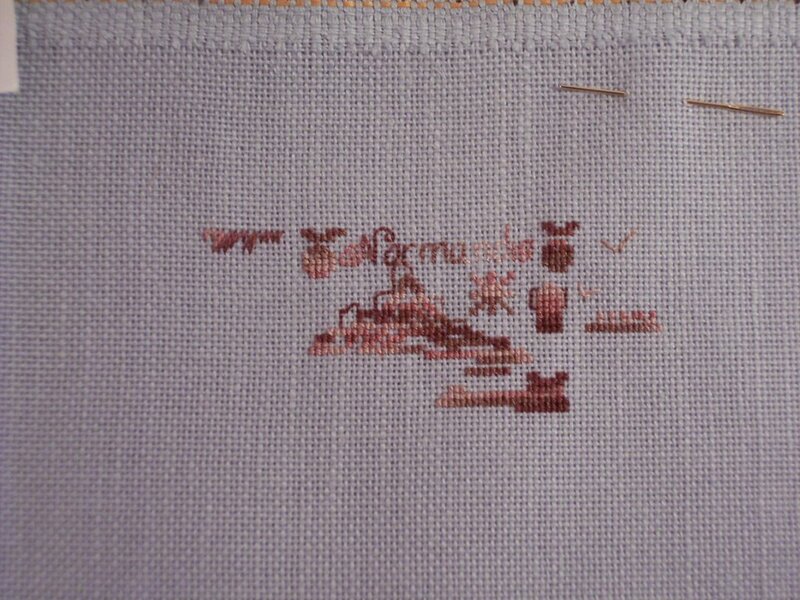 It smoothed out a lot and the wool poofed out to fill in the less covered spaces. Of course, it'll go to be critiqued and I'm sure that will turn out badly, but I don't care. It was new to me. 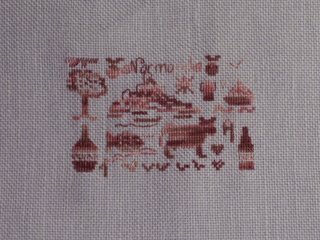 I didn't get as much stitching done this week as I wanted. Life intervened in a very hard, sad way for me. Anyway, the next few posts will be of my updates. 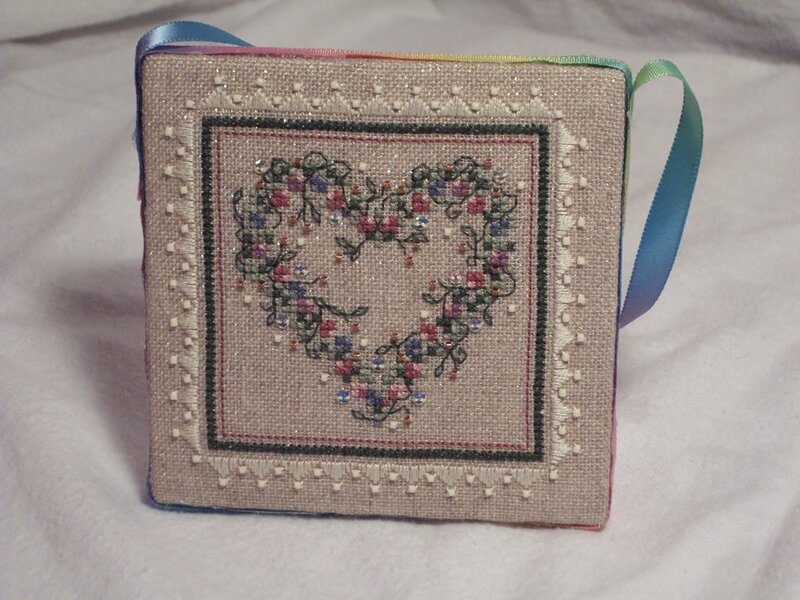 This is Sweetheart Tree's Potpourri Heart from the kit. I finished it into an ornament. My daughter won't let me give it away. I did the finishing this week is why it's here. 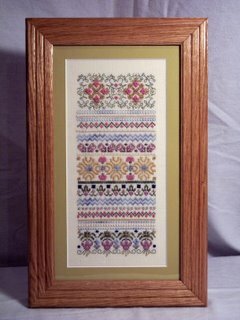 The second picture is of a pulled thread design we did at the May meeting of Pocono Mountain EGA. I did the mounting this week and need to put the gold cord around it. 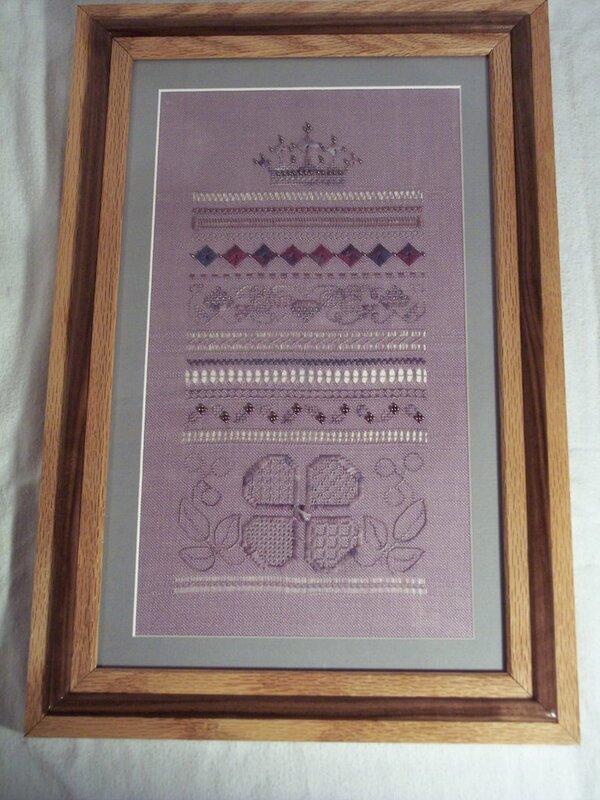 The copper colored silk behind it is from Plumridge Silks. They have a good bargain lot where you get lots of silk in lots of colors for cheap. I'll probably make a few more of these because I like the way it turned out. This is probably my easiest and quickest project. I'm almost done with the second section now (two days after the picture) and it's coming out well. My daughter is loving the way it looks, which is a very good thing. Anyway, what it shows is that you can change up everything about a design except its bones and still get a good result. 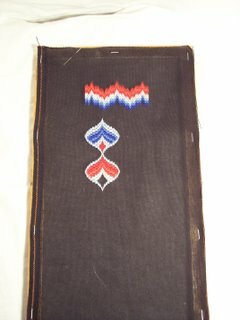 Nothing on this outside of the way the stitches go is like the pattern. I decided to combine these two, since they're by the same designer. I'm having fun with these - on the MTM, I've managed to finish two of the butterflies and get halfway done on two more. My husband really likes the way they look and the fine detail. He's an observer. It's part of what makes him such a good scientist. The Midi Mystery 2 is coming along, slowly. I finished the two columns and am finally! starting the bottom flourishes. 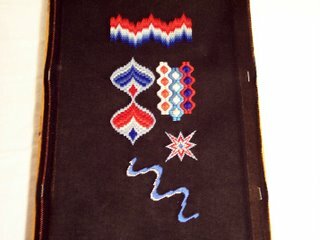 When I'm done with those, it's on to finally doing the Rhodes stitches! I'll get there. Eventually. My husband agreed that I should order the Japanese Garden design before it goes out of circulation next month. So, another project! I'm not going to start anything else until I get at least one of these four done, though. So, my first finish after starting this blog is here. It's okay. I didn't really like the brown too much. 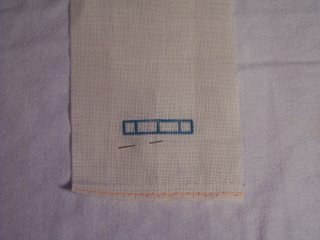 I'm doing the same thing again over two on colors my husband picked - baby blue linen with Needle Necessities color 134. I've got the tree, one apple and part of the Calvados bottle done. The good thing about picking these for ornaments is they go fast. Of course, finishing them's going to be a challenge. I haven't quite decided how yet. Ideas? As promised, my husband took pictures last night. 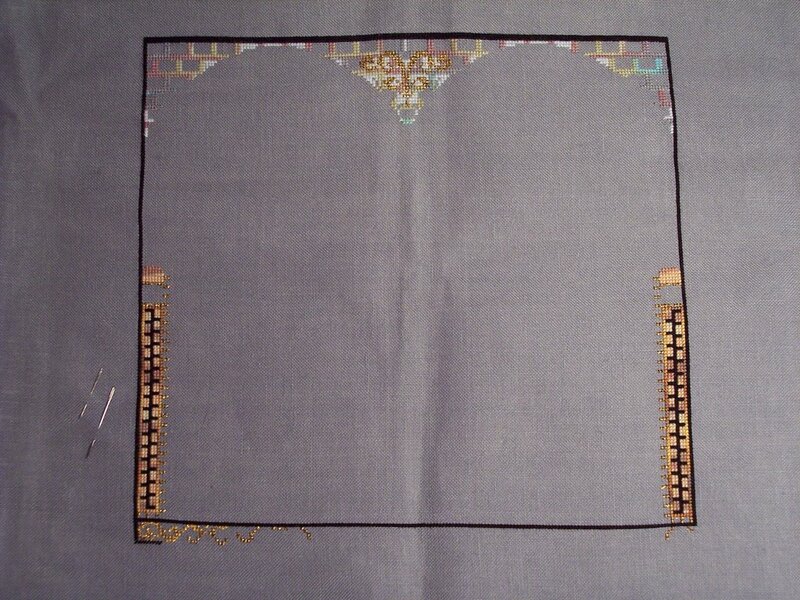 Here's the progress on my Crewel Confidence GCC. As you can see, I got the little flowers at the bottom left done. They were a fun whipped spiderweb stitch. Now I'm working on the flower at the bottom - long and short stitch with color blending in four colors. I've completed two and, to me, it looks horrible so far. You'd think they'd give us a simpler shape than this three lobed flower with all the direction changes to do first. Oh well - it's getting closer to done! Maybe in the next couple of weeks I'll have it out of my rotation altogether. 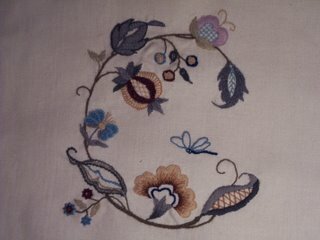 It's one of those days where, try as I might, I haven't been able to get any of my stitching done. I've been working on the newsletter for my local Embroiderers' Guild chapter and taking my daughter to and from her first day of the semester. Not usually a big deal except this is my first issue of the newsletter and the last editor had everything saved in a program I've never heard of despite being a Mac owner for twenty years. Oh well. Several ad scans later and some judicious use of MS word and it's done. It's at the copy center now being printed. My daughter, on the other hand, is on a schedule where it's just too short to drop her off and pick her up and just too long to sit in the parking log and wait. At least it's only Tuesdays and Thursdays this way. The other three days are long and I can go home between. I'll be so happy when she finally gets her license and saves up enough for a car. 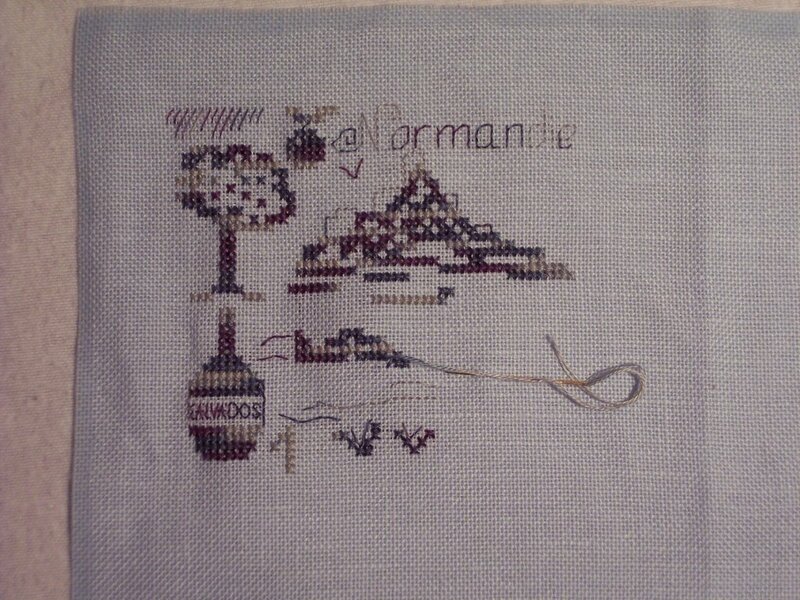 On a bright note, I finished Normandie over one yesterday. Most likely tonight I'll have new pictures to put up of my WIP's. They're actually progressing pretty well. 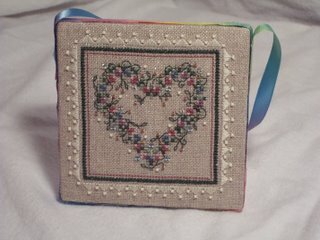 Today is one of those great days for stitching. It's rainy and windy out and a bit on the chilly side. Can't go out to do anything, and who wants to do house work on a holiday weekend? Looks like I'll be able to finish up my Normandie over one in the next day or two and get a lot more done on the other pieces. It's a good thing, especially since Lynne came over on Thursday and we went buying at Banbury Cross. This is what I've started a few days ago. 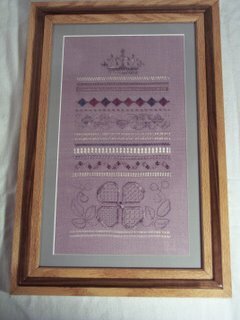 It's the Normandie block from Annick Abrial's Terre de France sampler over one on Rue Green 28 count linen using DMC's new variations color 4140. So far it's going well. I need to make several of these for Christmas presents for my husband's work team - they have had two two month long trips to Normandy so far and will be taking another next spring. I get to go with! I went on one of the previous two and loved it. We stayed at a guest chateau so we pretty much had our own real apartment. Each one of these I do will be with a different background and floss. Now to get several done in time! Since taking this picture Tuesday night, I've finished the boat and the cidre bottle and am working more on the cow.